Lucie? Dr. Frank's sister, Lucie M. Gardner. Sidney? Need you ask? Sidney Perley, the long-time editor of the Essex Antiquarian. He published the magazine from 1897 to 1909. We are working on the next issue of The Gardner Annals. Last time, we looked at the Table of Contents for Volumes I through V of The Massachusetts Magazine (TMM). Also, we featured a bit about R.A. Douglas-Lithgow who provided several articles to Dr. Frank's effort. This time, we will look at the Table of Contents for Volumes VI through XI. We also will feature a few things from those times. After that, we will bring out lots of topics, especially those that are apropos to today. This image is from Vol II. Sidney quit publishing. He mentioned Dr. Frank's periodical. 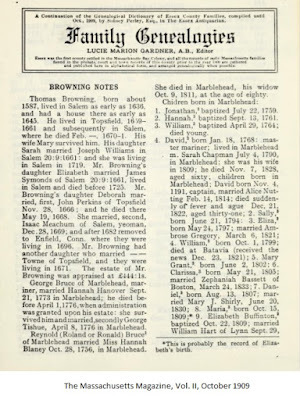 Lucie picked up and published several articles on "Family Genealogies." Anyone wishing contribute an article, please contact us at jmswtlk@tgsoc.org. What I have seen by looking thoroughly at Volumes I through V is that the initial thrust with many authors settles into a few authors providing the material (while working like mad). Several factors went into the demise of TMM. One had to do with the age of the authors. Then, WWI came along. We will show a graphic from a survey done in 1914. 06/14/2017 -- Sidney last published Oct 1909. 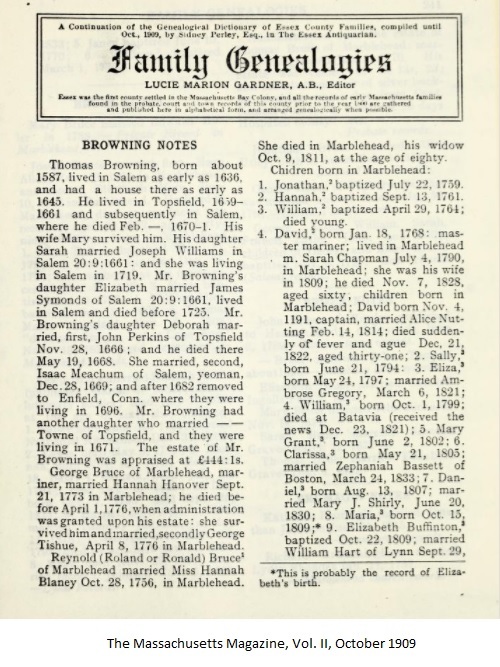 The next issue of The Massachusetts Magazine had the first continuation by Lucie.